English student fodder and all-round classic An Inspector Calls is a play that pops up on the touring circuit more than most, so I expected the usual drawing room drama set-up. I desperately tried to forget the plot after watching a recent BBC adaptation, so that I could be surprised by the big twist. Forgetting such an iconic plot as this proved impossible and I remembered within a few minutes, but what did surprise me was absolutely everything else about this National Theatre touring production. 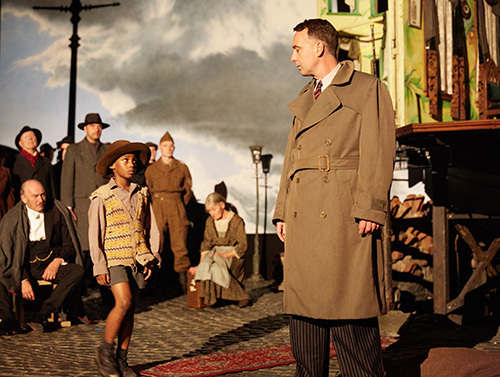 Director Stephen Daldry takes JB Priestley’s classic play that so many of us know and love, and injects it with something completely fresh. From the beginning, the surrealist stage is set. The floorboards don’t quite fit and curl over the edge of the stage as children silently play with the traditional red curtain. 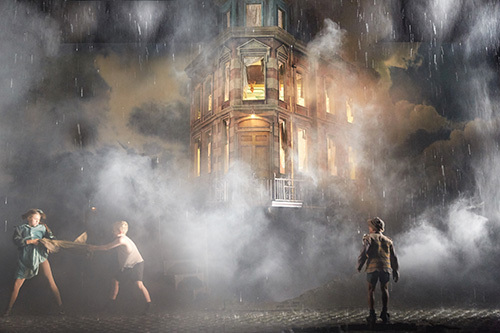 As discordant orchestral music blasts across the auditorium, the curtain lifts to reveal a macabre family home, and rain pours on the playing children. The walls of the house unfurl like a doll’s house to reveal the action within. The house’s proportions make the characters seem oversized, giving an Alice in Wonderland effect, after Alice has drunk the potion to make her grow. As the story unfolds, the unravelling of the Birling family is punctuated with special effects. 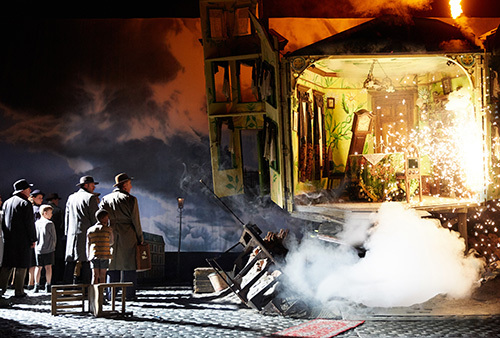 The Birlings are broken down emotionally by Inspector Goole, as the family home falls to pieces around them with dramatic pyrotechnics and smashing crockery. Caroline Wildi created an abhorrent Sybil Birling, and it was very gratifying to watch as she set herself up for a huge fall. Although the surrealism of this production gives a suitably eerie feel, at times the focus on staging limits the truth of the story; the emotion and drama come predominantly from the staging and effects, not the relationships between characters. This felt like a deliberate choice, and it’s not necessarily a bad thing. We have become used to intimate performances through film adaptations and Daldry creates something that can only be enacted on a stage, a truly theatrical experience. 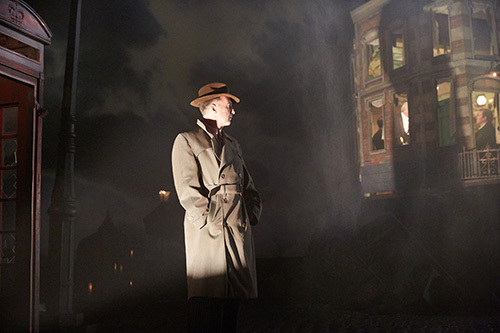 Stephen Daldry’s An Inspector Calls might be different from what we’re used to seeing, but the beauty of theatre is that the same script can be reimagined in countless ways. This particular imagining made me gasp and feel terror, which is exactly what a thriller should do. The atmosphere created by the incredible staging made me forget that I was in Southampton, and for an hour and forty minutes I was in the West End.